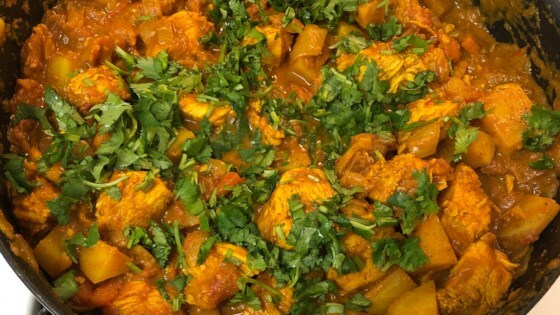 "A delicious authentic recipe of chicken curry. I've had this almost every day growing up. If you want a more creamy and smooth sauce, blend the onions and tomatoes before adding the chicken and potatoes." Heat the olive oil in a large skillet over medium-high heat. Cook and stir the onions in the hot oil until translucent, about 5 minutes. Add the ginger-garlic paste and continue cooking another 5 minutes. Reduce heat to medium; stir the tomatoes into the mixture and cook until the tomatoes are pulpy, 5 to 10 minutes. Season with the cayenne pepper, curry powder, garam masala, turmeric, and cumin; cook and stir another 5 minutes. Add the chicken and potatoes to the mixture in the skillet; simmer, stirring occasionally, until the potatoes are tender and the chicken is no longer pink in the center, about 20 minutes. Sprinkle the cilantro over the mixture and continue simmering another 10 minutes. Serve hot. Excellent recipe-I have made this dish many times. My ex-is from bangladesh. I always top off with fresh lemon, also i added fresh mushrooms. I made this dish tonight and it is very tasty. I added 2 more potatoes to it and had to add about 1/2 cup of water. Also needs salt. Very good! I would recommend probably doubling all of the spice ingredients listed (with the exception of the cilantro). You can also add coconut milk for a bit more sauce and a smoother texture. AWESOME dish! I added mushrooms and doubled the spices. My family loves this!